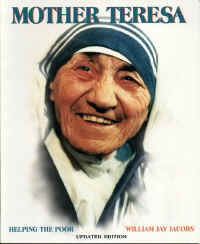 Mother Teresa is perhaps one of the best known and loved persons of the twentieth century. Read about her remarkable life, dedicated to the service of the poor. Born in Macedonia in 1910, she became a Catholic nun, and in 1929 traveled to India, which is predominately Hindu. Read about her life and work through the Missionaries of Charity among the poor and unwanted, and later as her faith and dedication influenced the world. The Prime Minister of India, Indira Ghandi, said of meeting her, "is to feel utterly humble, to sense the power of tenderness and the strength of love."